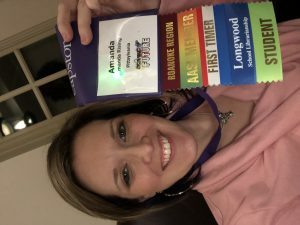 I was so excited to attend my second VAASL conference. 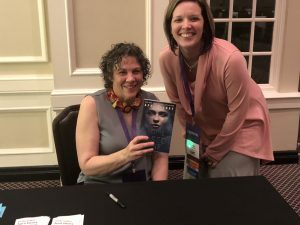 My first session was with the author April Henry. 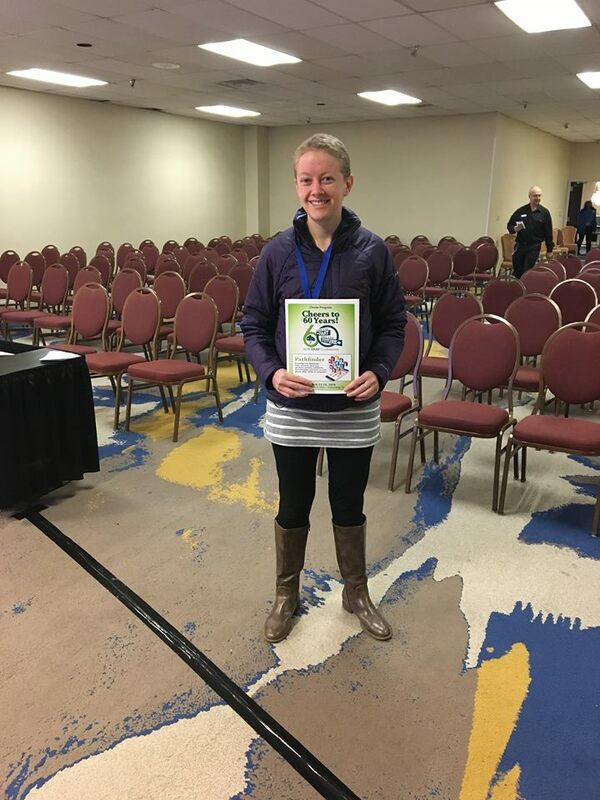 Her presentation was excellent, and I was able to take away the information about her writing and resources she would use with students. I am going to have my student enter into the contest for mystery writing on her website. At the end of the session, I was able to meet April Henry. Her quote, “You can edit bad stuff, but you can’t edit nothing” resonated with me because I currently teach a writing class. My next session was Keva Planks. I love Keva Planks. The presenter was awesome and shared that on the Keva Planks website there are ideas for using the planks in any classroom. The activity I liked the most was creating an “image” that represents a book and explaining how it does. I also attended the sessions on collaborating with secondary math teachers and graphic novels in the classroom and library. Overall, these two sessions also provided me with resources to use in my future library. In the future, I plan on attending all the days of the conference. 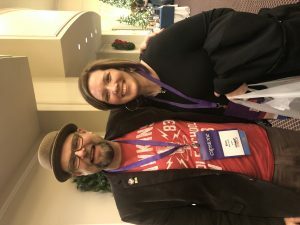 I attended the VAASL Conference for School Librarians on Saturday December 1st, 2018. I benefited a lot from attending this conference to help prepare me to come a school librarian in the near future. The first session I attended was about a Britannica Online, a reference site that is very user friendly for students to navigate and find reliable research resources. The website offers accommodations for students who are visually and hearing impaired, as well as ESL students. The second session I attended was all about pre-created lessons that I now have access to. These lesson plans are for the librarian to use in all subject areas, including choir, art, and health/PE. This conference was beneficial and I hope to attend again in the future. 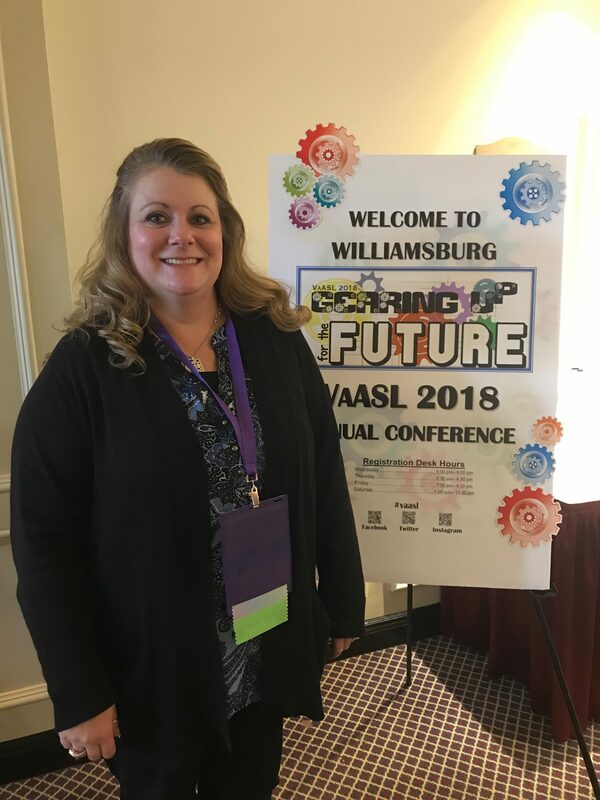 This past week I was honored with the opportunity to attend the VAASL (Virginia Association of School Librarians annual conference in Williamsburg. Though this was not my first year as as an attendee, it was my first time ever as a presenter at a conference; it was so exciting while also a bit nerve-wracking! The best part was getting the opportunity to network with amazing librarians across the state as well as coming away with so many wonderful new ideas that I can’t wait to implement in my library. 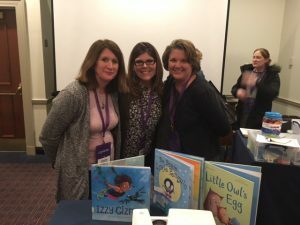 Several of the sessions that I attended focused on utilizing the newest Virginia Reader’s Choice selections across the curriculum which I think will be very beneficial for my students and teachers. Thank you so much for the opportunity to attend this worthwhile conference! 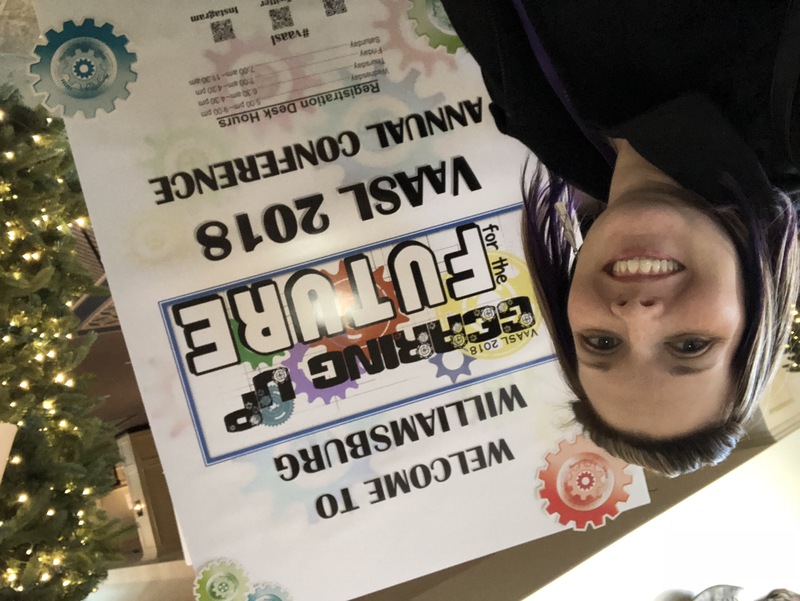 I attended one day of the VAASL Conference on Thursday, Nov. 29, 2018. I was immediately amazed by the enthusiasm and excitement that each person had for their jobs! The presenter in the first session I attended discussed her first year as a school librarian and all the wonderful things she did. The keynote speaker was amazing and her focus was on Maker Space and STEM in the library. All of the sessions I attended were informative, but I think the most beneficial to my future as a librarian was the one entitled “Connecting the Dots.” This session connected many picture books with STEM activities to use with younger students. I left the conference with many great ideas and increased enthusiasm for completing the school librarianship program! Below is a picture of me with the presenters of the “Connecting the Dots” presentation, one of whom is a Longwood student also! From November 29 through December 1, I had the great opportunity to attend the Virginia Association of School Librarians (VAASL) 2018 Annual Conference in Williamsburg, Virginia. The event was held at the historic Williamsburg Lodge right in the middle of colonial Williamsburg. 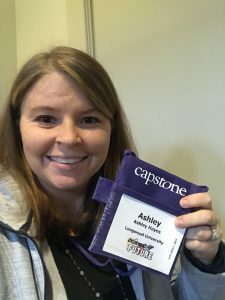 The conference was my first of many (hopefully) as an aspiring school librarian. Perhaps I will BE a school librarian in my district by the next time I attend! I was able to travel with a fellow alumni, Ashley Barker, who is the school librarian at my school, Tunstall Middle in Pittsylvania County. She goes every year, and she was excited to be able to bring me along and show me the ropes. 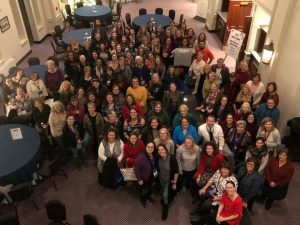 The weekend was jam-packed with classes and large group sessions where we could hear from Virginia librarians and authors. 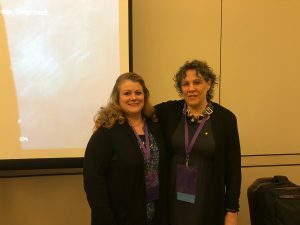 One of our main group sessions was with Leslie Preddy, librarian and co-editor of School Library Connection. 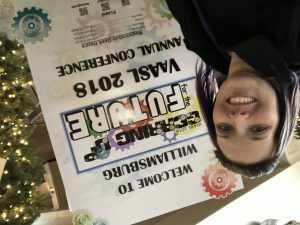 She spoke to us about maker spaces and how to make our libraries more exciting. During the other main group session, author Alan Gratz spoke to us about his novels and how he came to be an author. He was also around all day to sign his books. 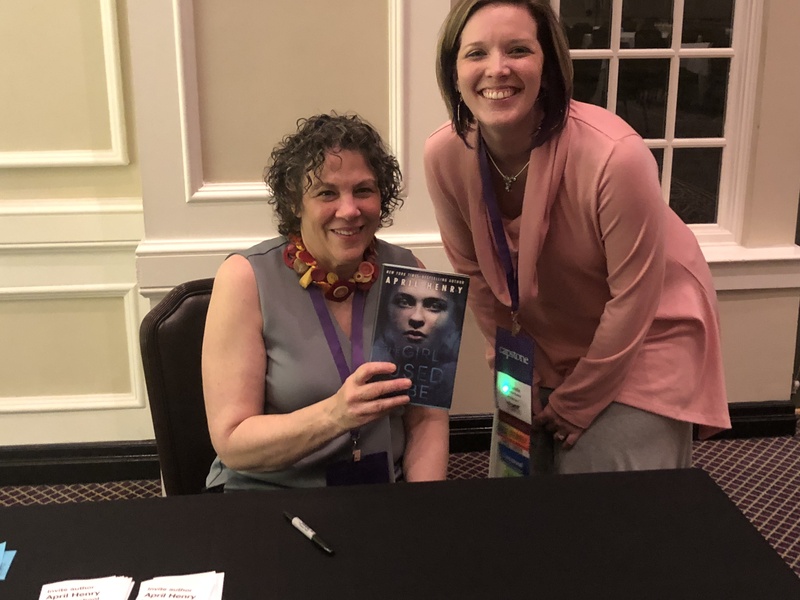 We also had a dinner where librarians throughout the state were honored, a School Librarian of the Year was awarded, and we heard from author April Henry. She is known for her mystery/thriller young adult novels, and she was fascinating. Attending this conference taught me so very much. I was given useful, applicable tools to use in my classroom as a teacher and as a future librarian. I went to sessions that taught us how to set up a Battle of the Books and an effective book club. I learned how to help my special needs learners in the reading classroom. Librarians and professors showed up the most valuable web sites for teachers and librarians, and those chosen by the AASL for usefulness. I was inspired to come back to my classroom and emphasize all that I learned to help my students be more successful in their reading, but also in school in general. I also heard what it takes first hand to make a library an interactive learning space that helps the entire school, including faculty and staff. 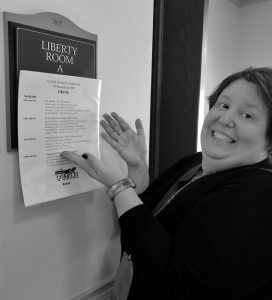 I hope to make this conference an annual event to stay up on the newest developments in the school library, and to network and stay in touch with other librarians that want the best for their students just like me. Thank you so much for the opportunity to go! It was such a rewarding opportunity to be able to attend the Virginia School Counselor Association conference this year. It felt great to be around school counselors who were passionate about their jobs and students. As a graduate student, they had opportunities for us to mingle with current professionals each night. They even hosted a graduate student cafe for all current graduate students. At this cafe, I had the opportunity to have my resume reviewed by a current director of school counseling in Roanoke schools. She also provided helpful tips when at an interview. The sessions I attended provided multiple resources and information to help me in my future as a school counselor and in my current internship. I am grateful to the College of Graduate and Professional Studies for supporting me with this opportunity. 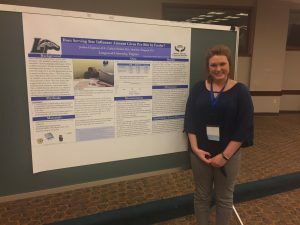 My name is Molly Dailey, and I am a 2nd year graduate student in the Communication Sciences and Disorders Masters program in hopes of becoming a speech-language pathologist. Recently, Longwood’s College of Graduate and Professional Studies provide me with the wonderful opportunity to travel to Boston, Massachusetts to present at our national conference on my thesis research. During the conference, I got the opportunity to connect with current professionals in my field, and listen to current evidence-based practice lectures on assessment methods and therapy tools to use in the future. Throughout the weekend, I felt it was most useful to listen to other well-known professionals talk about upcoming issues in our field that I may face upon graduation. For example, many sessions talked about the need to standardize our approaches for assessing and treating clients with swallowing disorders. It was interesting to listen and talk with a range of professionals about these various things that could potentially impact my future career. I also found it beneficial to reach out with future employers and professionals to begin networking and finding my place within our profession. I felt it was important to introduce myself and begin to make those connects for the development of my career later on. Overall, I found the entire conference to be very informative, and I would highly recommend all graduate and current professionals to attend in the future! I am Amy Ligon, second-year school counseling graduate student. I had the opportunity to attend the Virginia School Counselor Association’s annual conference in Hampton Virginia. 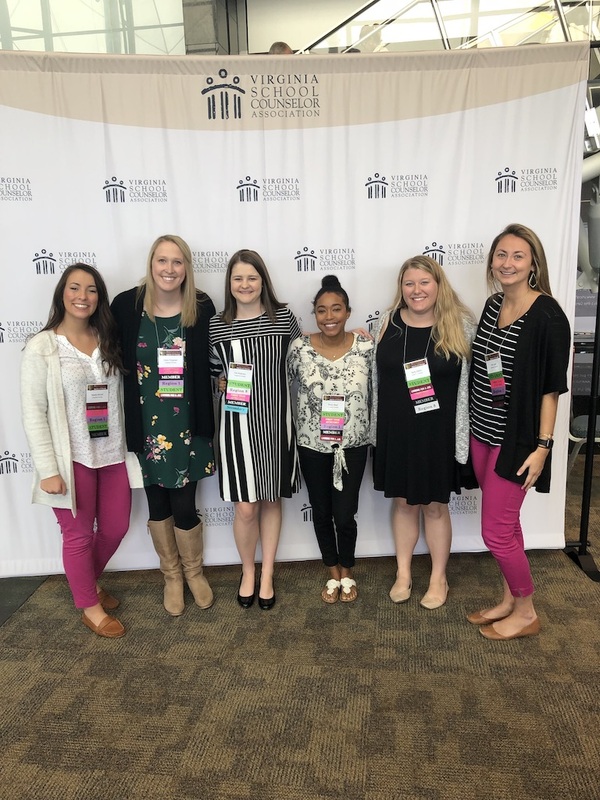 I attended the conference with several of my fellow Longwood University school counseling classmates. It was a wonderful experience. I volunteered Wednesday afternoon at the registration booth where I got to meet several school counselors from around Virginia who were attending the conference as well. Thursday, we attended three to four breakout sessions covering topics pertaining to all levels of school counseling. I also had the opportunity to attend the graduate student career café where I received feedback on my resume and interview tips from seasoned school counselors from all over Virginia. On Friday we attended three more breakout sessions. I enjoyed the breakout sessions that were interactive and had fun take homes to bring back to my internship. I did actually end up using two activities that were introduced to me VSCA at my internship the following week. After the breakout sessions on Friday, we packed up and headed back to Farmville. All in all, VSCA was a great experience. I am already looking forward to the conference next year. I’m so fortunate to have attended the Speech-Language- Hearing Association of Virginia conference in Williamsburg! During this conference, I learned about a variety of topics including augmentative-alternative communication, selective mutism, and collaboration within the school system. The session that was most interesting to me was about selective mutism, which according to the presenter, is a childhood anxiety disorder that inhibits a child’s inability to speak and communicate within social settings. The presenter discussed how the disorder gave the child “feelings of death” whenever they were required to speak and she provided some helpful therapy techniques that therapists can use when working with these children to help them overcome some of that anxiety. In addition to the sessions, I was also able to network and meet some great people who shared the same or similar interests. They provided me with ideas and techniques that I can utilize in my practice. I am so incredibly grateful to Longwood Graduate Studies for providing me the grant to attend this conference and I can’t wait to go again next year! After attending the SHAV conference and the different sessions that were offered, I expanded not only my knowledge in speech-language pathology (SLP), but also in audiology. I learned more in depth about over-the-counter hearing aids and the implications it has on our community. It was really interesting to hear about audiology from actual audiologists’ perspectives, and not just SLPs. Since I am the Graduate Assistant for audiology, I feel this will broaden my knowledge when assisting our audiologist with patients since I have not only a more broad knowledge of this field, but also because of the details I learned from this conference. 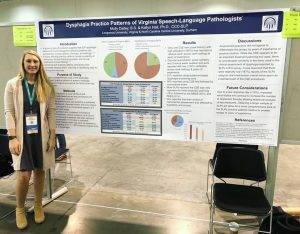 I hope to be able to advocate for my field of speech by informing future clients and/or professionals I collaborate with the importance we have on audiology.